I’m here to feature glue guys and girls from every sports team in the North Shore Conference. These feature articles will showcase the athletes whose efforts tend to be overlooked, but are major factors in their team’s success. In the fourth feature of the ‘Glue Guy’, West Bend West boys basketball head coach, Todd Pyszora, had great things to say about his Glue Guy. What is the name of your Glue Guy? How does your Glue Guy help your team succeed? What little things does he do? Coach Pyszora explained that off the court that Logan, “...sends out emails to (the) whole program (and) leads captains workouts.” For West Bend West basketball, Coach Pyszora claims that Logan strives to, “...leave a legacy in our basketball program.” Coach Pyszora enjoys having Logan as an, “...extension of our coaching staff.” He represents their program on and off the court, but like the Glue Guy, he does it in a humble, quiet matter. 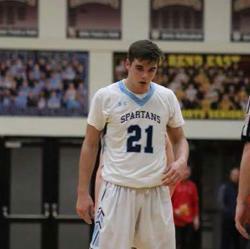 Logan Rupnow is a 6’3 senior, #21, and a three year varsity player for the West Bend West Spartans. He describes Logan as, “...hard-working, fun to be around, social…” In addition to basketball, Logan is the Vice President of the National Honors Society at West Bend West, a 4 year varsity baseball player (2017 state champion), and enjoys hanging out with friends. As a senior Logan has decided to go to Winona State University to pursue a career in Chiropractics. You can catch Rupnow and the Spartans live at home on January 25th, when they welcome the second place Homestead Highlanders into town. Once again, thank you to Coach Pyszora and West Bend West for taking the time and consideration to fill out the questionnaire. In my 3rd feature article of the “Glue Guy”, I was fortunate enough to get a response from Port Washington Boys Basketball Head Coach, Brian Hebein. Defends the teams best scorer whether it is a guard or a big man. He takes the most charges on the team, he rebounds well, and dives on the floor for loose balls. He is also a team captain and 4 year varsity performer. 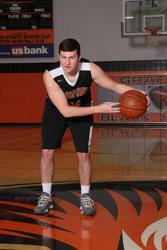 Jacob Lippe is a 6’3 senior, #3, and a four year player for the Port Washington Pirates. Jacob is described by Coach Hebein as a, “...fiery, ultra competitive person. He brings energy and effort to every single practice and game.” Outside of basketball, Jacob is also involved in football, track, and the Port Washington Best Buddies program. In his free time, Jacob enjoys fishing, golfing, playing card games, and listening to hip hop music. For the future, Jacob received a football scholarship from 2018-19 FCS champions, North Dakota State. 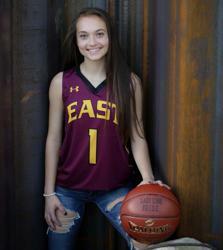 Lippe and the Pirates are at home January 11th, as they continue conference play against the Grafton Blackhawks. Once again, I would like to give a shout out to Coach Hebein, for taking time out of his day to fill out the questionnaire. In my first feature article, I was lucky enough to sit down and talk to Grafton’s head Boys Basketball coach, Damon James. Enjoy! Ben does all the dirty work that doesn't get in the stat book. He guards bigger players, gets on the floor for loose balls, is communicating on the floor. Off the court, quiet and reserved. How does he bring this team together? He has excelled in his role, knowing that what he does helps to give our program chances to win. Ben Wilkin is a 6’1 senior, #34, utility player, and a second year starter for the Grafton Blackhawks. So next time you are at a Grafton Varsity Basketball game, make sure to check out all of the small things Ben Wilkin will do for the Blackhawks. You can catch the Blackhawks live on Friday, December 7th when they play against Homestead at Grafton High School. I want to give a big thank you to Grafton Varsity Basketball Coach, Damon James, for allowing an interview about the Grafton Boys Basketball Glue Guy.